This is not intended to be an accurate A-Z map but just a rough plan, not even naming most of the streets; it also does not show much of the 'suburban development' along the High Street and Norwort Road, especially north of the New Town area. There is considerable sprawl in that direction even though the population of the town is less than 1000 (twice what it was 50 years ago). Some additional features, such as pubs, are marked with red numbers. 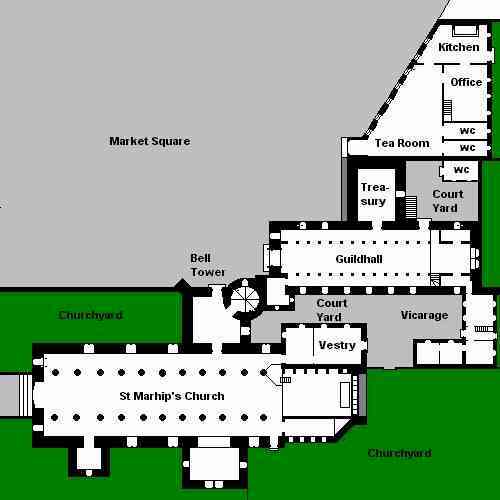 It should be pointed out that the original town was clustered on the east bank of the river under Castle Hill and consisted of the Market Square (circle), the church, and the precinct now called The Warren, north of which is the so-called Queen Anne district of small but attractive houses built in the 18th Century. West Farnisham was built mainly in the early 19th Century around the breakwaters constructed in that period, when the medieval wooden bridge was expanded in stone, with the addition of Canute's 'suburb' at the end of the century. 'New Town', on the site of the old jousting field and sheep common, was a project implemented by the only Socialist ever to hold important office in Farnish (Sam Mitherglew, 1879-1949); it really has nothing to say for itself, although the intention was good, as it is very Stalinistic in style or lack thereof, with its five monolithic concrete six-story blocks. Luckily, it is somewhat off to the side, and Sam was never able to tear down the Warren as he would have liked to do. It is really rather difficult to map the Warren, since it is a jumble of two-to-four-story narrow houses with little snickleways and alleys running between rather than proper streets. There is a war memorial by the cemetery in St Marhip's Circle, which was also built by Sam Mitherglew, along with the Grammar School -- he was a patriot even if he was a fool! The Market Square was just a large field until it was laid out as a cobbled circle by Lord Farnish in 1832. He intended to build a grand crescent of Regency-style buildings, but couldn't afford to complete the project -- there is just his obelisk/fountain in the center.